Portrait of Mary Elizabeth Crimm Amos. Wild hair, high collar, intricately detailed attire, and a stare of complete boredom. My kids make this same face when I force them to sit still for photos. Haaha! Perhaps she was pestered to pieces by her son Alonzo to sit for this portrait? Maybe it was her second husband, Rezin Amos. We’ll never know for sure, but what we do know is that she sure didn’t seem to enjoy the process! Almost completely faded, on the back of this photograph, is the photographers mark; B. Howell Adamston, WV. It was a valuable clue when searching to learn more about her. Born in 1837 in Harrison County, West Virginia she was alive to see so much. Her birthplace wasn’t even considered ‘West Virginia’ when she was born!! It wouldn’t be until she was in her mid-twenties that West Virginia gained statehood in 1863! Heck, she might have even known famous Confederate general, “Stonewall” Jackson, who was born in Harrison County himself, not too much earlier than Mary was! 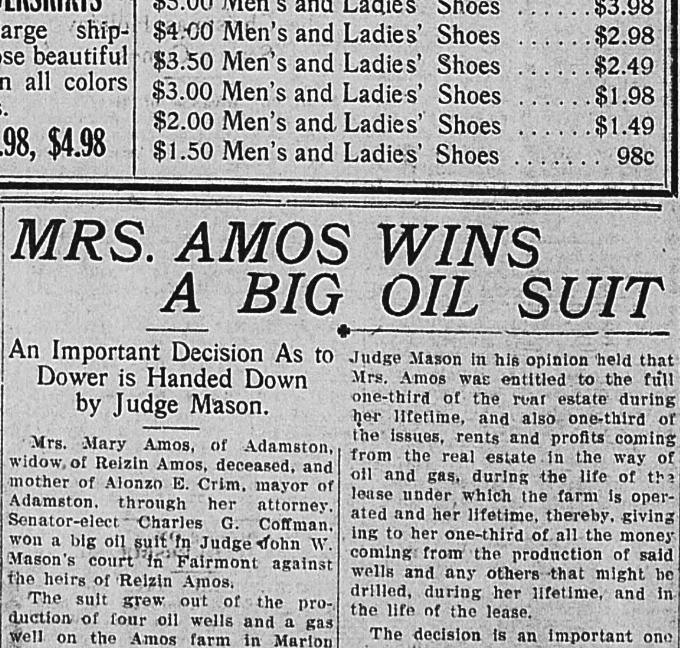 She was quite the talk of the town at one point, as she fought a legal suit against the heirs of her second husband, Reizin Amos. You can read this fantastic article about it here. Mary passed in 1933, but not before burying her only child, Alonzo Crim, in 1928. He was the fruit of her first marriage, to George W. Crim, and was born during the height of the Civil War in 1864. She can be found as a child, with her parents, Samuel Southern and Nancy Radabaugh, on the 1850 US Federal Census, listed with the surname Southerland. As for the misspelling of her name on the back of her portrait? Well, it seems that’s how her grandchild preferred it, so I’ll just go with it.